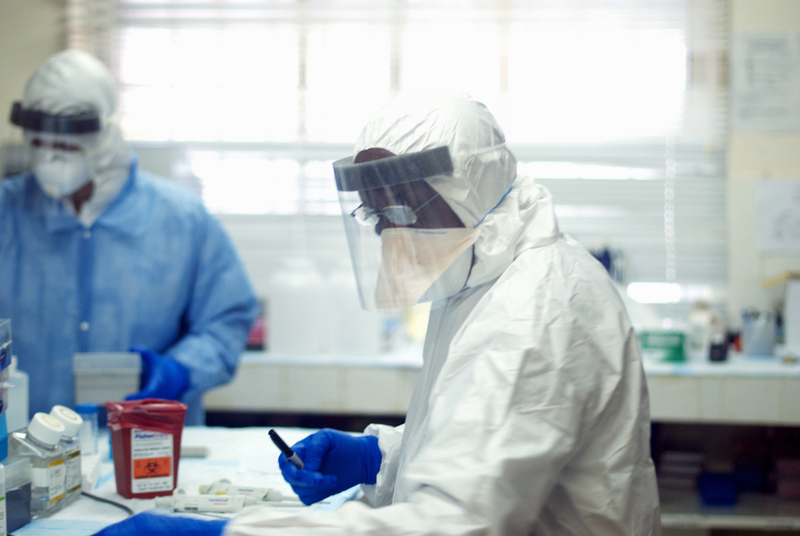 Augustine Goba (right) heads the laboratory at Kenema Government Hospital in Sierra Leone. He and colleagues analyzed the viral genetics in blood samples from 78 Ebola patients early in the epidemic. At first, the scientists who named the virus thought it caused hepatitis in a surgeon (whose initials were "GB"). But it turns out the virus actually came from a small monkey — a marmoset — that had been used in an experiment to diagnose the surgeon. GBV-C had nothing to do with the surgeon's illness, but that serendipitous finding has led researchers on a globe-trotting investigation of the life and times of this microbial hitchhiker. Some studies in recent years have hinted that persistent infection with this virus might slow disease progression in some people infected with HIV — leading Stapleton to suggest that maybe the "GB" in the virus's name should stand for Good Boy. The latest chapter in this saga involves Ebola. In a widely reported study last summer, Pardis Sabeti, a computational biologist at Harvard, collaborated with colleagues who collected plasma from Ebola patients in West Africa (at great personal expense to the scientists — five of them died while carrying out this research). Sabeti's team sifted through that material looking for RNA (the genetic material in Ebola viruses). And they posted the genetic sequence of all the RNA they found in a public database at the National Institutes of Health. Some blood plasma samples collected from Ebola patients in West Africa also contained GB Virus-C.
David O'Connor, a pathology professor at the University of Wisconsin in Madison, realized that digital treasure trove might also include information about GBV-C. And sure enough, he found the genetic fingerprints of that virus in the records of 13 samples of blood plasma from the Ebola study. Though six of the 13 people who were co-infected with Ebola and GBV-C died, seven survived. 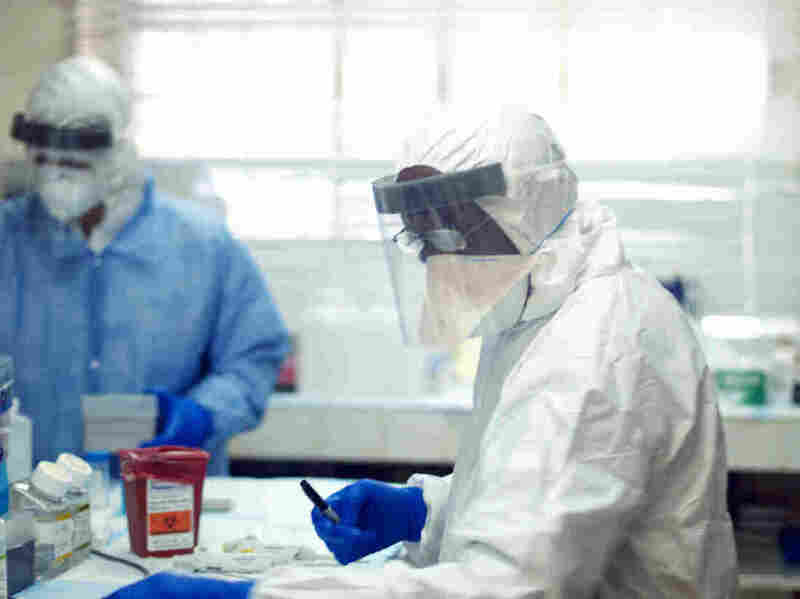 Had the GBV-C virus helped to improve the odds of the Ebola patients who survived? The numbers studied are far too tiny to know. But the question is worth pursuing, say O'Connor and his colleagues in their description of the work, published in the February issue of the Journal of Virology. "We're very cautious about over-interpreting these results," O'Connor tells NPR. He's now waiting to get a bigger sample, to see if there really is a strong connection between GBV-C infection and survival. It could simply be that people ages 20 to 40 are more likely to be infected with GBV-C — and more likely to survive Ebola. But there is a theoretical reason why the virus might be helpful: It infects a type of white blood cell, and (when an infection is active) it apparently damps down part of the immune system. With HIV, the thought is that the virus helps reduce inflammation, and that in turn helps slow the onset of AIDS. "It's not severe — it's not enough that it makes people immune-suppressed," Stapleton says, "but it does reduce the inflammatory response of immune cells." Hypothetically, this virus might also reduce inflammation in some people fighting off a roaring Ebola infection. "It's something you would predict," Stapleton says. "Although often what you predict doesn't happen, so I wouldn't have predicted it." But if that's the case, perhaps drugs that act in a similar manner would help as well. And beyond the possible implications for HIV and Ebola, O'Connor says, "we're getting to some of these greater questions about ... other situations where this might be beneficial." There's been some talk about deliberately infecting people with GBV-C in instances where doctors want to turn down the immune system. "That might be something worth testing in a clinical trial," O'Connor says. "The thinking is," he says, "this infects hundreds of millions of people around the world today; we knowingly transmit it in blood transfusions. It's essentially a safe virus." But it may not be entirely harmless. Last October, Stapleton and collaborators at the National Institutes of Health published a study suggesting that people with a cancer of the lymphatic system, non-Hodgkin lymphoma, were more likely to be infected with GBV-C. If the virus actually increases the risk of this disease, it must be by only a small amount; having the virus is much more common than having the cancer. Again, the evidence of a cancer link is only suggestive. "If it turns out there is actually a risk for cancer, that would provide another reason to find out more about this virus," O'Connor says. "We always have a bias," he says — assuming that viruses are bad for us. "But now, with new technologies, we're finding there are viruses like GBV-C ... that don't seem to cause disease." How many more viruses like this might be lurking? "I actually think it's not that many," Stapleton says, "and I wouldn't have said that 10 years ago." 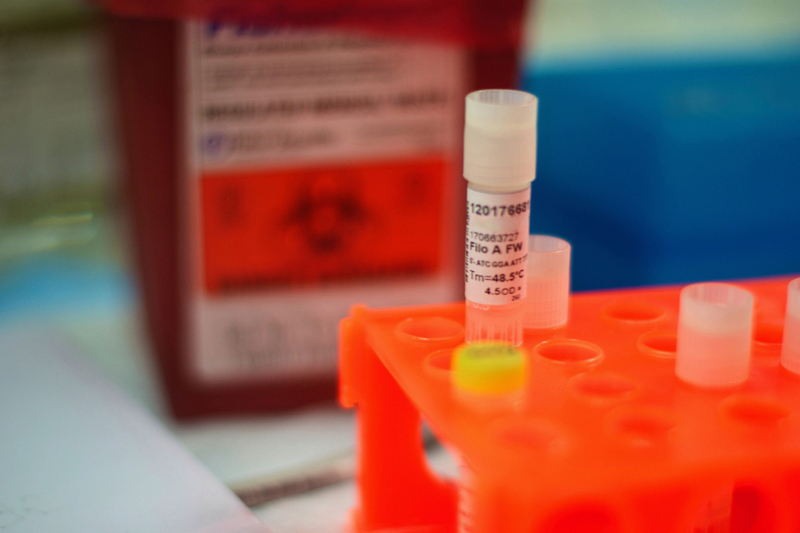 Because the technology that helped identify this virus in Ebola blood samples is so powerful, he reasons, it should also reveal other lurking viruses — if they're there — in similar studies of human tissue. "At least if you look at the many, many [types of virus] that we now know about," he says, "not many are showing up."